I'm in serious need of chocolate! 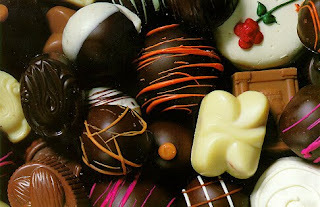 I used to be a chocoholic.. a very bad one (but one that the chocolate industry would welcome with open arms hehe..). My secret stash would usually consist of at least two large bars of chocolate and my bag usually holds a small bar or two. I'm not picky, any brand would do but my favourite was the usual: Cadbury.. though a tad too sweet for some, it was the best for me. But as years went by, I started to realize that I could actually live without chocolate.. suprise²! My never-ending supply for the secret stash started to disappear as with the bars in my bag. The next thing I knew, I had gone 1 month without chocolate. Then the 1 month turned into 3 months, and the 3 months turned into 4 to 5 months. I still had to have a fix of chocolate every now and then, but I was no longer setting aside a 'chocolate budget' for the month.. and I survived! Even at the time of the month, I no longer needed chocolate. But these past few weeks have been such a rollercoaster of feelings, that I find myself literally crawling to the doors of stores just for a bar of chocolate! Chocolate has never been my saviour but now it seems like I can't live without a small bite of it every few days. In fact, I just came back from 7-11 for another dose of this. And since my digestion and metabolisme rate is not as it used to be (Okay, for once I admit I'm getting older.. though I'm still 16 next year =p), this is quite alarming la to me hahah.. 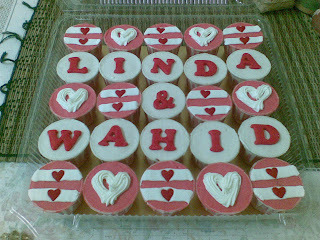 Anyway, yesterday in the wee hours of the Aidiladha morning, I made another custom-made request for Shahril's sister. She married and they wanted to bring something to the groom's house for the reception on his side. 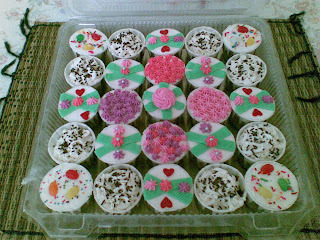 I'm used to bringing my 'experiments' to school.. and sometimes when I have leftover cupcakes, I also bring them to school, knowing people would eat them regardless of how buruk I decorate them or how tasteless I think they are (They joy of having a 'family' in this school hehe..) but to make an actual custom made order is not something I enjoy. Still, as with kak Shima, he was also confident in me.. adoi laaaa..
And it so happened, I had just started experimenting with these instant fondants. In fact, I had just recently asked Sya for some tips since she had started experimenting earlier along with Dayah. We DO plan to take classes for these but haven't got the chance to learn it properly yet.. thus, the experimenting! 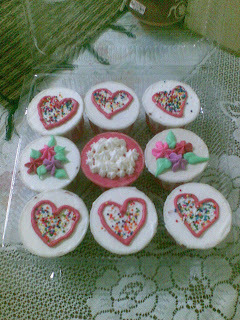 Leftover cupcakes were decorated very² simply, especially since I was frustrated by the outcome =( Though my family (I urged them to take those cupcakes back home) loved them, thats what families are for kan.. I still have some leftover fondant that I'm not sure what to do with.. any ideas? Oven in use ~ KEEP OUT! Heheh..
After a whole day of rest on Friday, coming back from Ayer Tawar, I was kinda bored come Saturday. 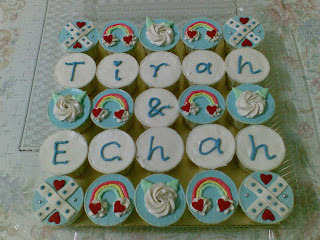 Yes, I had my extra class for my fifth formers but after that I had a whole lot of time to myself.. and yes, I know, I'm also avoiding the 'kenape tak concentrate PhD during that free time' heheh..
Cupcakes given to Ad's twin sisters for their 16th birthday today.. Been meaning to do rainbows eversince I discovered giler byk colours at the shop we go buy baking thingeys but always malas to try (I also berangan wanna do some ladybugs but tak reti. One day I'm gonna try one with the sun and rainbow and stars hehe..)). Mlm smlm thought, try je la.. syg nye my awan tak jadi. 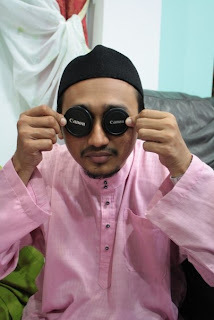 Sgt buruk so cover up with the jumob heart haha.. aci ke? 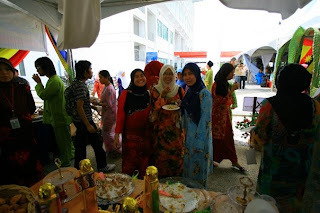 Now thinking on how to do something for a friend.. hmmm..
KKU stand for Khemah Kerja Ukur, something our school has made compulsory for all 2nd year students (during my time, it was for 1st years ~~ 'During my time'?!!? 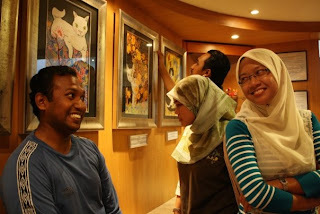 Aiyak, I feel so old la plak using that expression!). Now it uses an English name la pulak.. 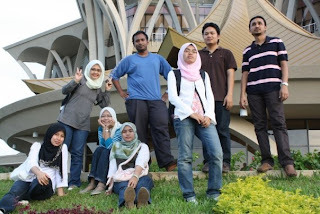 Annual I-dont-know Geomatics Programme something like that laa.. 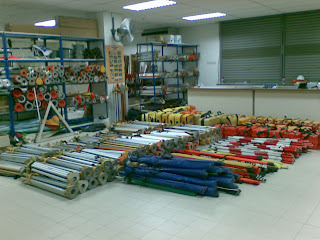 The few days before, we had to check the tools we were gonna take along.. sgt byk ok! The usually empty-looking geomatics lab seemed a bit 'messy' to our eyes then. Zabidi and Azam ngan bagusnye menyusun all the tools 2 days before and the day before pulak, me, Azam and Zulham helped him with the minor but many adjustments. We went there on Friday morning, 3 buses from here and Zabidi asked us to get on one bus each (there were 3 GAs) but of course la kitorg tak mauuuu :D Me and Azim dengan degilnye naik bas yg same hehe.. The trip took around 3 hours since we weren't using the highway and sgt malu when midway, my bladder suddenly buat hal. At first I ignored it and tried to sleep, but after half an hour, tak boleh tahan laaa.. and dgn malunye mntk pakcik bus driver to stop at the nearest musolla or masjid. The driver wanted to stop at any petrol kiosk since he thought it would be more comfortable but then the seconmd driver mengomen, "Dah macam ayam nak bertelur dah adik ni.. berenti je kat masjid mane²"
Mau pulak the students sumer crane their necks nak tgk SAPE penyebab bus kene berenti.. and the USM bus behind us pun benti la jugak kann. Tahan la telinge dengar the driver of that bus tanye me, "Lega dah?" After that we were given rooms to our respective rooms. When Zabidi gave me this piece of wood, I thought he was joking. 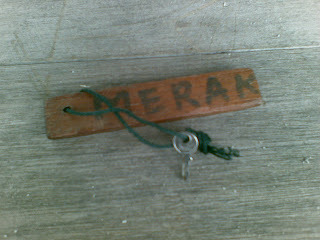 I didn't realize how TINY our key was.. Membuat sy meragui keselamatan bilik kami ye! That afternoon, it was raining so we had some briefing in the hall before retiring to our rooms and getting ready for dinner and the next briefing.. briefing aje kan! The next day, I woke up early and skipped my usual nap after Subuh (Oppsss..) to get ready to go around the students' 15 work stations. I wore my sneakers and walked out while waiting for Azim to get ready, all the while wondering WHY was it that my usually 'loose' sneakers were quite comfortably snug.. but only on my right foot. I had a real fright when I realized a BIG, BLACK FROG had decided my right sneaker was a great place to spend the night.. ughhh! Okay, maybe I exagerrated on the BIG part, maybe it was only medium sized, around the size of my fist.. but WHAT THE HELL WAS IT DOING IN MY SHOE? Huwaaaaaaaa.. sib baik la pakai socks or I would've scrubbed my foot dah lepas tu. 2 students became my knights in shining armour (one of them is someone both me and Azim agree to call 'budak ensem tu' hahaha.. Oppsss!) 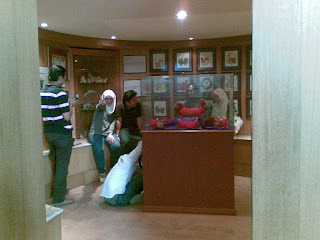 by shooing the 'thing' away.. though pastu I had to endure them shouting 'KATAK' at me everyday.. 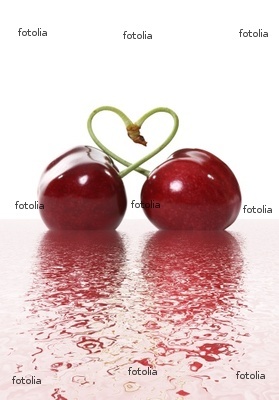 cisss!! 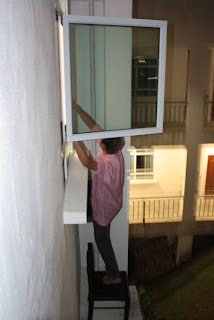 Still felt a bit geli-geleman when I remember it haha.. Anyway, our daily routine was mostly the same everyday. Breakfast at 7.30am then off to the 15 workstations were we usually did 2 rounds in the morning before doing our unofficial duty as the 'food patrol' in the dining hall. Then off for Zohor prayers and some quick rest before resuming our rounds and enjoying it since the sites were beside the sea and the afternoon breeze was such a welcomed friend! 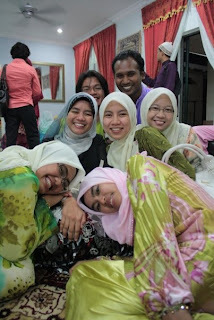 Around 5.30pm we'd go back fopr Asar prayers and usually stayed put in our rooms till Maghrib and dinner. At night we'd have sessions in the hall with the students and after supper, we'd go back to bed. I forgot to take picture of the students at work. 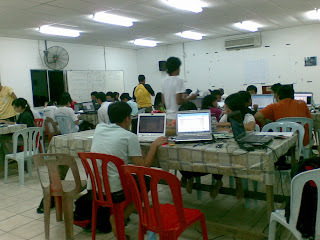 My favourite workstation was at this 'haunted house'.. not haunted la kot, but empty. 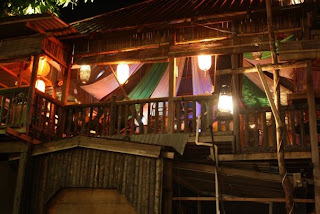 Still, we called it the haunted house and there were so many mosquitoes around that the boys (fair skinned Chinese all of them) all got red in face haha.. cian diorg! Always mengadu whenever we go to their workstation. Another favourite one was the school since it had small huts where we could sit around hehe..
My favourite time of the day plak was of course when we ended our rounds and were back in our rooms.. but it wasn't because I hated the work tau! Our chalet was adjescent to these group of Chinese male students and what we most look forward to is because these boys really love to come back and shout, "Sayaaaang, abang dah balik" (in Malay ye.. thats why I find it hilarious! )while acting as if they've just come back from hard work in the fields sambil mengelap² peluh with the small towels they wore around their necks. While some of their friends who came back early would act like 'wives' welcoming their 'husbands' home.. I can't help laughing at them! 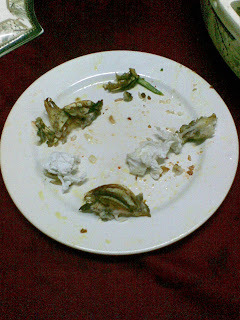 Hehe..
As for Zabidi and Pojie pulak, I guess THEIR favourite part was when they caught an ikan kerapu and habis la dok tayang at me hahah.. still dunno SAPE actually yg tangkap since both ngaku diorg punye kan but that night we had some very nice fresh ikan kerapu for dinner. 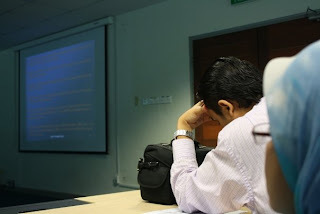 I forgot to take the picture before and by the time I remembered, this was what was left..
Ni plak picture of us yg bored while listening to Dr Wan Aminuddin talking in front to the students. 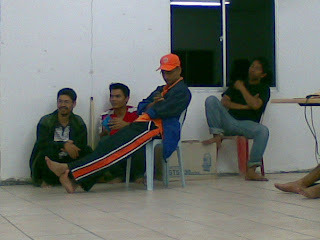 Here you can see berbagai gaye duduk from the technicians: abg Nizam, Zabidi, abg Junaidi and Pojie. 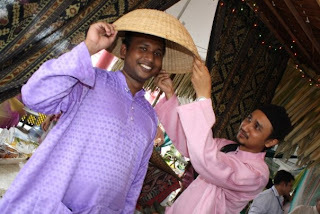 Ni plak a fellow GA, Azam..
Me and Azim takde la pulak gambo ye?!?! Ni plak the students busy doing their work.. tp sbnrnye mlm tu diorg lawan CS sesame sendiri.. Zabidi pun leh tumpang sekaki plak tu.. 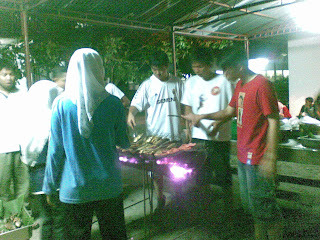 The day before the last, we had a BBQ so bergotong-royong la menyiapkan bende for that night with some female students. Yg berdiri tu sumer sedang siang the ikan and sotong while yg duduk mengupas bwg..
Why I takde? Heyy, baru lepas contract membasuh ayam okay! :p Kire baik lagi la dari Pojie yg ngaku AJK arang so tak yah tolong memotong. Yg tak tahan tu, bleh la bising kate nak tangkap kerapu lagi mlm tu byk² so bleh tambah utk bakar (ade hati!!). Yg ayat tak leh blah tu is,"Nnt sy tangkap byk nnt, silap² ikan yg dah basuh ni pun kene hantaq balik!" 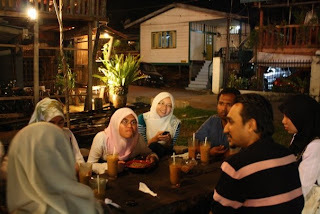 Then that night, membakar lah kannn. Those two Chinese students in white tu mmg amik contract membakar la.. sgt rajin diorg! While kawan² diorg in a dorm we call Satu Malaysia (sbb sumer kaum duk bilik tu ☺) did some entertainment by singing giler punye kuat from their rooms beramai². As for the finale, they nyanyi at the balcony beramai² ala Evita Peron la tu kunun.. tp nyanyi lagu Menara Ilmu (USM official song). Wish I bought my camera for THAT! Sgt bes tgk hehe..
Mlm tu, after some presentations from each group, rasenye sumer tidur ngan sgt nyenyak hehe.. breakfast next morning tu pun brape kerat je yg bgn. And btw, the mak cik masak sgt sedaaaappp! Around 12.00pm, we were ready to go back to USM. Bags were stacked into the 3 buses and our school's Hilux (ni Azam and Zabidi tgh pakai kasut.. dedicated to Azam who asked, "Kak Ayu tanak amik gambo sy pakai kasut?" Hahaha..)..
..and the students had all sat down in the seats, ready for the journey home. But.. Ya Allah, nasib baik tak gerak lagi! Aci ke, all tools sumer org lupe! Turun la balik bus to load all those in the bus balik.. uhh, sabo je la sumer org hahaha.. sib baik ingt! Arrived in USM around 3.30pm kot. We had to arrange everything back in the lab before going home but believe me, I had the best sleep that night hehe.. Currently I'm the GA for Geomatics. Thats why I'm usually busy on Mondays and Thursdays. I generally love these classes.. the only downside to it is that I'm usually very 'tanned' by the end of the semester. 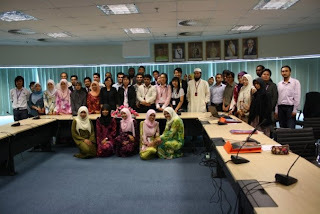 Anyway, last year I wasn't told to be present in the Geomatics camp as I was the only female in the group. 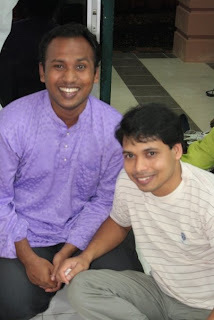 However, this year since I have Azim (a girl tau! 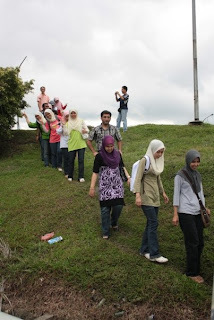 ), Dr Sanusi and Dr Wan Aminuddin asked us all to go for the 7-day-long Geomatics camp at Ayer Tawar..
..so when Zabidi asked me if I wanted to tag along when he did the setting of the baseline, I quickly agreed. I've never used any other sophisticated tools in that lab and was itching to try it out. 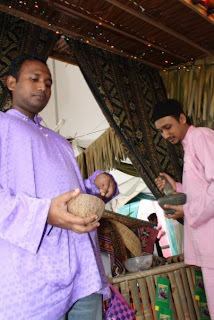 We asked Azim and Azam to go along as, even if it was a two-man (or women) job, at least we were left in pairs at each point. The journey took 3 hours (biar betul?) using the jalan lame and me and Azim who were sitting at the back of the Hilux sgt la tak selesa dilambung². And sampai je, we trus cari kedai nak makan hehe..
Around 1pm, we started our job to find suitable points to set the baseline. 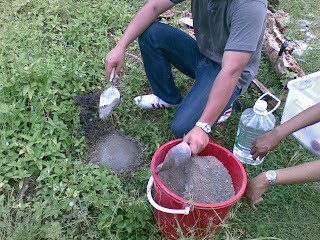 We found the 3 points we wanted but one was to be marked with some cement mix we took from the Concrete Lab. So here's Zabidi after finishing the first point. Somehow, boleh kitorg oohhed and aahhed at the cemented spot.. aparaaaa bdk² postgrad Awam nihh..
Then me and Azam went to 'take care' of the first point near the main road. 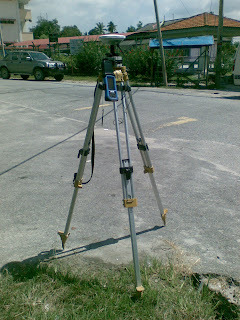 This is the tool we used (please do not ask me what it is) but has GPS and measures the bearing of those three points. Sgt cam perak ok, main ngan alat tak penah pakai heheh.. Anyway, around 5pm dpt la berenti solat and siap to go back to campus. 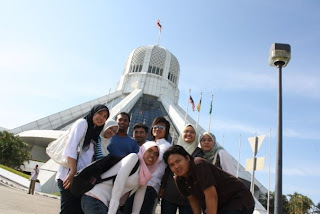 We were in the sun for around 3 hours only, and I sudah berbelang okay.. kaki, tangan (sape suh pakai 3quarter lagik) and muke.. camne la nak duduk sini SEMINGGU!! Well, we'll see! Rashid dah cadang for me to take a before and after photo hahah.. cait!! Actually I have a few nozzles I haven't tried due to the lack of the creative gene and lack of rajinness. 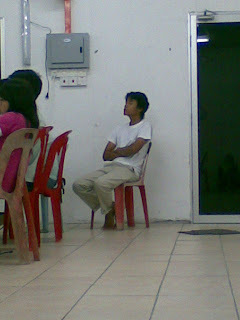 And since my dear² student, Irfan, telah menyatekan cikgunye mempunyai lack of imagination (ouch! ), I thought I'd try these new nozzles in hopes of new ideas..
Now I know that I really need other new nozzles and ideas.. as well as colours! 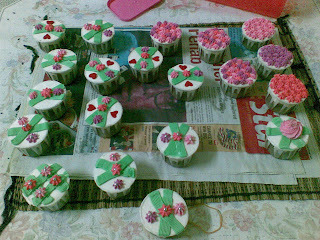 Balik² kaler tu je sy pakai kaaan hehe..
Dayah, bile nak blajar fondant nih? Just got back from my final class for form 5. Alahaiiii, pas ni tak jumpe dah kot budak² tu. Tetibe sy rase sgt la syg ke diorg, wpun selalu je gaduh ngan diorg² nih.. Anyway, since agak la sengkek at this time of the month (bile la nak dpt duti tuition nih), I couldn't actually belanja them la as I would've prefered. Still, after going through my kitchen, I found that I could manage to whip up a batch of chocolate muffins.. yeay! 2nd try here.. and still learning. Somehow I still find them a tad too sweet. So thats what I did this morning. After Subuh went to Pt Buntar market to find some yummy nasik lemak for breakfast (seriously, this kakak's nasik lemak is very fragrant.. amik bau nasik pun bleh kenyang.. okay! Tipu there!!) then back home after eating, trus sit down to make them. Got quite a lot and am thinking of giving some to abg Junaidi for his transfer to Kubang Kerian in the middle of this month. 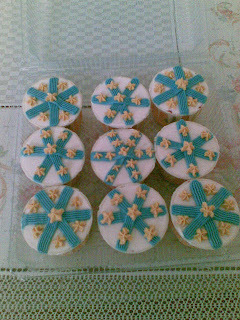 Anyway, after baking them, I started on the frosting.. and I noticed something! Sy ni sgt la suke buat base kaler putih ye! 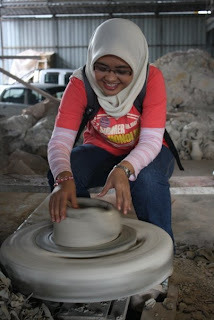 Sungguh tak berkembang haha.. and sungguh tak menarik! Aiyooo.. I also realize I've no new ideas whatsoever for deco and I keep repeating old designs. Ishhh.. ape ni Ayu? Thats why I tried doing the butterfly one.. BUT, it turned out sgt buruk okay. So to cover up the burukness, I had put chocolate chips on the butterflies which turned out to be a mistake because lagi buruk jadi nye.. So I added those hearts (yg seriuos tak sedap but good for deco) but also managed to memburukkan lagi..
Sib baik la my students baik je. 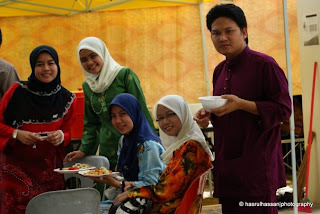 Terime dgn redhanye hasil tgn cikgu nye hahah.. Yg Haziman, Nazreel and Hazril whom I met in USM after class (they didn't come to my class due to a History Workshop), tak tgk pun, trus makan je.. huh! Sy telah dibeli oleh tuan sy di suatu hari yg damai di Queensbay. Sy masih ingt lagi di hari tersebut, tuan sy tergesa² masuk ke dlm kedai di mane sy dipamerkan smbl memakai selipar Jepun. Diceritekan, sandal tuan sy telah digonggong anjing sewaktu beliau ke rumah ayahnye. Maka, disebabkan itu, tuan sy telah mengajak adiknye untuk ke Queensbay demi mencari pengganti bg seliparnye yg telah putus itu. 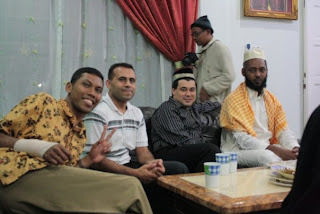 Sy berdoa agak beliau tidak memilih sy kerane kelihatan dia sgt tidak stabil, okay! Menakutkan!! Agak lege jugak hati sy apabile mendengar beliau berkate kepade adiknye bahawa beliau hanya ingin mencari sandal berwarne hitam atau putih kerane beliau berkonsepkan one-sandal-for-all. Tetapi ntah bagaimana, beliau akhirnye memilih sy! SY yg berwarne keemasan yg pada mulenye telah dikatekan kepade adik beliau yg beliau same sekali tidak mahukan sy..
Dan beliau sgtlah gelojoh kerane selipar jepun yg dipakai beliau terus dimasukkan ke dlm plastic yg asalnye berisi sy sementara sy terus dipakainye. Maka bermulalah hidup sy bersama tuan baru sy ini. Akhirnye sy dpt adapt padenye dan merasakan diri sy sgt dihargai beliau. Beliau mengakui bahawe sy sgt selese dipakai wpun beliau pd mulenye tidak berkenankan kaler sy.. tp itulah kehidupan. Sy diterime dan disayangi juge beliau dan buktinye, tiap kali sy putus, sy akan dihantar ke klinik di Pt Buntar supaye sy dibetulkan dan dpt dipakai lagi. Namun begitu, hubungan kami ade juge naik turunnye. Seperti semalam, hampir sahaje sy hilang kepercayaan terhadap tuan sy. Petang itu seperti biase, tuan sy bersiap² untuk jogging bersame kak Jah. Selepas menukar baju, biasenye beliau akan ke kerete untuk menukarkan sy dgn kasut sukan kaler pink nye (tetibe ade kaler.. kate nak itam atau putih je kaaann!) tp sy rase ade bende kot dlm fikiran tuan sy sbb dia kelihatan agak termenung jauh (amik ayat Bai) ketike menukarkan sy dgn kwn sy itu. Dan tidak semena-mena, sy terdengar bunyi pintu kerete ditutup. Haaaaa?!! Sy masih berade di luar kerete ini, tidakkah beliau perasan? Pasangan sy sudah selamat di dlm kerete, tp sy? Hancur hati sy mengenangkan sy dilupekan.. dan bertambah hancur apabile tuan sy bergegas pulang tanpe memerikse keadaan sy. Tak dpt digambarkan betape remuknye hati bile menyedari diri ini tiade harge..
Sedang sy mengenang nasib sy, sy terdengar deruman Atos yg sgt dikenali.. yeay! 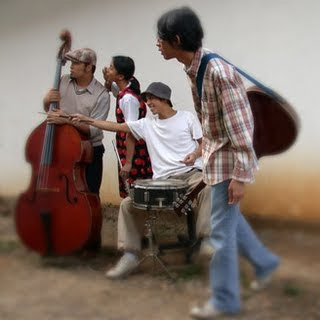 PFK kembali lagi. Kelihatan tuan sy bergegas mencari sy, smbl berkaki ayam.. Padan muke beliau, tinggalkan lagi sy di PARKING SCHOOL AWAM lagik!! Mesti dah sampai rumah baru pasan sy takde tu sbb dia selalu menukar kasut dahulu sblm keluar dr kerete..
Tp sy sgt bahagia, sayang jugak tuan sy pade sy rupenye.. Early morning, we woke up to get some breakfast. 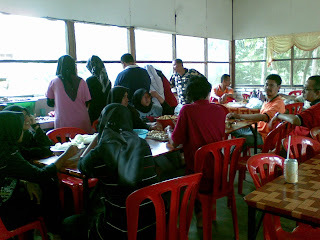 Actually we were invited to the Ramah Tamah Aidilfitri in UniMAS but we we too hungry to wait for 10.00am (which was more or less like 11.00am here.. no wonder la kitorg lapo kan!) This was when I got my first (and last) taste of the popiah with mushrooms. Seriuosly wanna try make them.. tp popiah biase pun sy tak reti buat, camne tu? So had our breakfast and while waiting for the bus, mcm² gambo la kan di amik mereke. Gambo tgh nak naikkan bendere la ape la.. mcm² hehe..
Sampai je bus, all of us serbu with only one thing in mind: Nak carik makanan Sarawak! 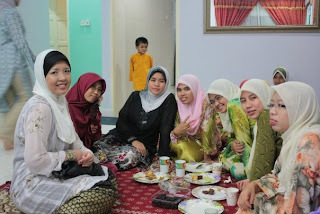 And nak tapau (dgn tak malunye) Hati Pari lagik ☺ But when we arrived, we were more distracted by the deco of the 'open house'. They really take it seriously here. 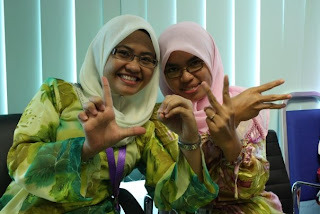 Sgt cantik and meriah..
Then we took off. Memasing dpt tugas haha.. to find something different. 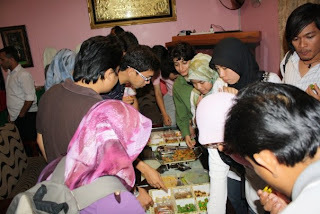 There are a few pictures of the food we got here but I'll post it in another entry.. ni pun dah byk dah ni weihhh! Ingtkan perangai buruk ini tiade yg nmpk but we were caught red handed by non other than Dr Wan himself haha..
..mesti dia malu tgk ex-student² dia merate carik makanan hehe.. 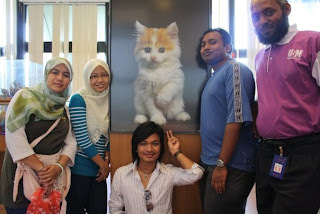 The staff there were helpful too when they knew we were from Semenanjung so they pointed out to us their specialties. When we finally sat down, we had a variety of food in our hands.. and with the help of Sabrina and Afnie (both of whom are our guides), we got to know a bit about the food. 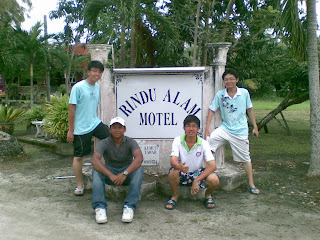 Pastu, bile kenyang, mcm² la kan. Take Rashid and Faizal here. 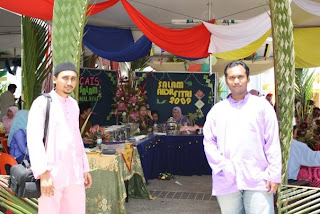 Here's Rashid mengintai klau this booth ade makanan yg different lagi..
..then him and Faizal buat ape laaa ngan the deco from this booth. Boleh? Ish ishh.. tudung saji di buat main. 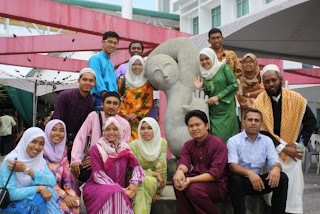 Konpius org UniMAS tgk bdk² USM nihhh..
Then as usual: group photo! After being given half an hour to get ready in the hostel, we started our jln² session. 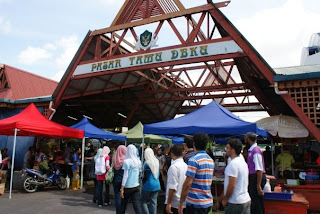 The first stop was Pasar Satok..
..and what did we find here? Jeng.. jeng.. ikan terubuk masin! I didn't wanna buy any since I'm not a fan of salted fish.. but Anim and Rashid telah mempengaruhi minda sy ini :p Then, further in the market, we found what we've been wanting to find eversince we went to Nadya's : Laksa Sarawak paste! Yeayyyy!! But here we were,. 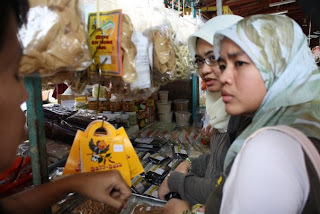 tak puas ati with the kakak selling it sbb tetibe dimahalkan harge paste itu setelah beliau menyedari kami nak beli byk (10 packet sorg.. and the were what? 7 of us?!?) Trus je we gi kedai sebelah dia yg jual harge standard.. hambik ko kakak! 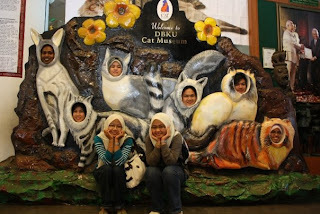 Heheh..
After that, we went to the Cat Muzium (Muzium Kucing).. 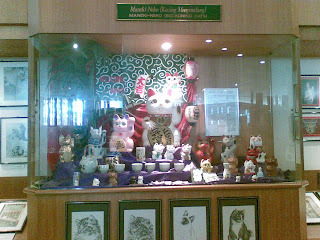 This is the entrance hehe.. sgt chumel kan! 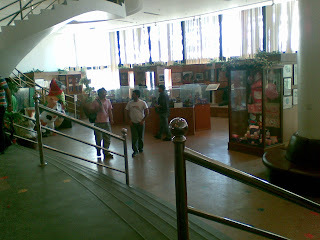 This is the view after you step through the entrance..
We went around looking at.. you guessed it: CATS! Tgk je Dayah, nampak aje camera no matter how you try to hide! 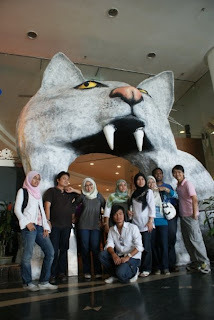 Pastu, they took us to DUN Kuching yg sgt cantik. But it was past office hours (mcm la klau opis hours diorg nak kasi masuk pun kan) so we took photos out there je, but syarat! Spent only about 15 minutes there. And the highlight of the day: Operasi mencari Kek Lapis! 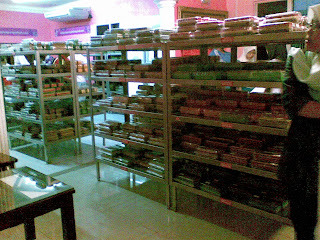 Sile la tgk budak² USM ni cam lapo tak penah jumpe makanan hehe..
Actually, they had this long table where they serve their variety of kek lapis for us to taste before buying. I liked this non-lapis cake named Cadbury which was VERY chocolatey (bought 2 of it). Then bought another 2 of Horlicks kek lapis, 2 Hati Pari (yeayyyy.. dpt pun! 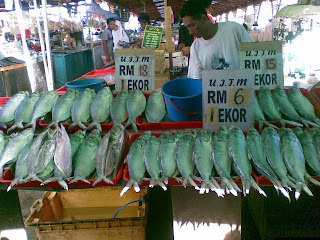 ), 2 Sisik Ikan (which is very yummy! 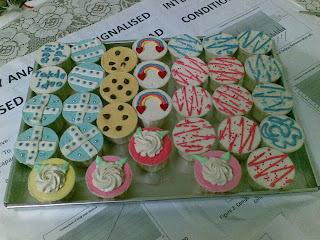 Byk giler asam they put in it and sgt cantik the pattern!) and 2 more Sutera Ungu (which is like Sisik Ikan without a lot of asam.. but enough to make it yummy!). The choices were too many and I forgot what most of them tasted like by the time I came at the end of the 'tasting table'. 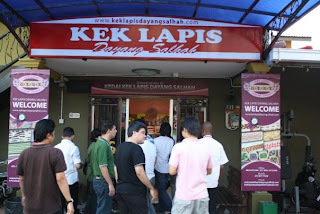 Then after penat memilih kek (and buying a bit more of those laksa paste :p), we went to a restaurant within walking distance from the kek lapis shop and ordered our first mee kolok with teh si peng! 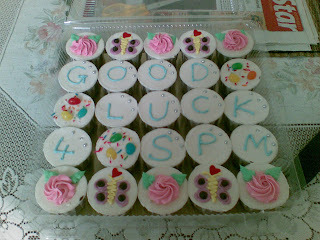 Yummy..
Kedainya itu juge sgt cantik tau! 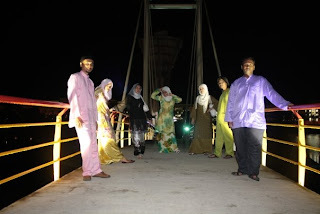 After that, 4 of us (me, Sya, Ija and Dayah) telah naik the penambang to go across the river to the Waterfront :p Promised Amer we'd meet him there and spent some time at the shops there to buy other things to bring home. Mlm tu Amer la anto kitorg balik ke college..
Did any of you catch the 8tv Quickie a few nights ago featuring the Indonesian band, Mocca? My motto in song-listening is: If you're not on the radio, I'm not gonna listen to you! I'm not the type to listen to all songs I could get my hands on, I usually stick to the radio-friendly ones and sgt la jarang for me to listen to other songs. If you go through my songs folder here, chances are you WON'T see songs that are not typical songs on the radio. So don't be suprised if I have this dumb expression on my face whenever you talk about any singer/bands that you really like.. sorry! Its just me.. However, flipping through the channels one day, I watched Prem raving about Mocca. I'm sure I've heard about them, but only through Adi's mouth rasenye. Since I was waiting for another show to go on air, I just sat through it.. and was I suprised! While listening to it, I tried to listen to other songs from this group and found that I kinda liked them hehe.. the chumel² kinda songs with the likes of Ingrid Michealson's The Way I Am and Lenka. Terus jatuh chenta, okay! Nyesal didn't search earlier when Adi first mentioned them centuries ago hahah..
Also found out (and guessing I'm the last to know), this song 'Secret Admirer' was once used in a Malaysian ad though I'm still trying to remember which ad. Help me, I go crazy when I can't remember things like this! 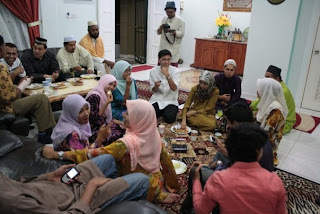 Currently sedang dgr their songs dgn perasaan mcm budak sekolah hehe..
Photo credit here to Faizal je kot?!?! 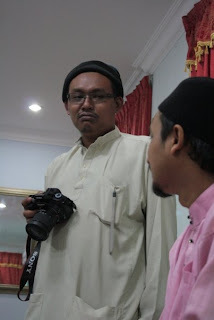 Dr Wan and Hasrul nye gambo I'm not sure ade skali tak in this entry. 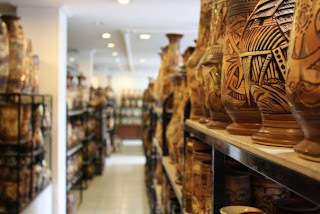 Ni si Faizal tgh garu kepale (paham ke idak ape org dpn ckp tu tak tau la kannn)..
Then after paying, I went out only to realize there was this place reserved for anyone to try their hand at pot-making (the decoration, NOT the drug!) I wanted to try at first but mmandangkan I was wearing a white t-shirt, hasrat itu terpakse dipendamkan but here's Dayah trying a hand at it..
We were supposed to go back to the hostel after that but somehow someone managed to pujuk our guides and the bus driver to take us someplace else.. any place would do! Hahah.. So we were taken to this row of shop houses which boasted some batik craft.. only to be disappointed to see Indonesian batik there which is easily obtained in the peninsular.. alahaiii, jadik laaa.. Had to go down this trail to reach the shop..
..but NO pictures kat dlm kedai la pulak kan! Had planned to find some Teh Si Peng (recommended to us!) but tak jadi when we noticed the coffeshop there wasn't a Muslim one. Wouldn't have minded much if we didn't see bottles and bottles og beer on the table. 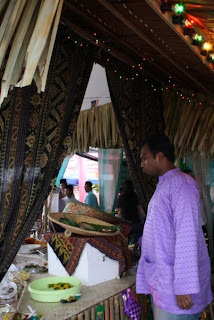 Then boarded the bus to Dr Wan's abode. Was hoping for Sarawakian food but got 'normal' food haha.. hey! 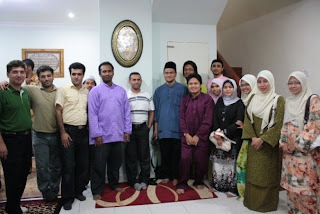 Who are we to complain, Dr Wan buat open house for us tu dah kire cukup bersyukur dah. And especially since we found another batch of Hati Pari here (fell in love with this traditional Sarawakian cake at Nadya's). 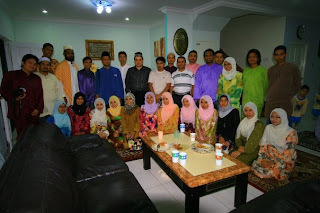 So here's some picture during the 'eating session'..
And another group photo with almost all participants in it. Sampai hostel, we couldn't resist the lure of this beautiful bridge at the lake in front of the hostel so we went there berangan² mau tangkap gambo la kan.. Jadik la kaaannn..
..and kat bus stand pun sempat lagik tu! Heheh..